United Service Co. offers complete support for commercial walk in refrigerators. North Shore restaurants, hospitals, manufacturers, and distributors come to our established business when they need anything related to walk in refrigerators. For more than six decades, our business has helped commercial customers build, install, and service walk in refrigerators that deliver reliable performance over time. If you rely on temperature-controlled environments to keep your products cool, come to United Service Co. Call and learn more about walk in refrigerators today. Walk in refrigerators extend the life expectancies of perishable foods. If you work in a restaurant, hotel, hospital, manufacturing/processing plant, school, or grocery store, you understand the importance of refrigeration. Even a day without refrigeration would compromise operations. Our services for walk in refrigerators in North Shore give customers peace of mind. Focus on daily activities instead of disaster recovery with our help. Custom build and install units. As a US Cooler partner, we can offer our customers top-of-the-line engineering and materials. Let us know what you need, and we’ll design and create walk in refrigerators in North Shore that meet your specifications. Provide emergency services. If you notice a fan cut off after food prepping late at night, don’t worry. Call our team, and we’ll send a trained technician out to assess the situation and keep your refrigerator running. Count on us 24/7/365. Support preventative maintenance. Your walk in refrigerators in North Shore may perform beautifully for years at a time with the right care. 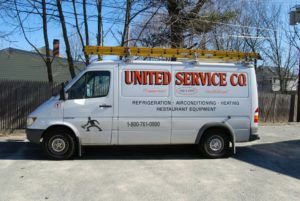 At United Service Co., we work with our customers to create customized maintenance schedules. We’ll regularly inspect your systems and offer estimates so you can make informed decisions about refrigeration capabilities. Offer repairs when possible. Our licensed and trained technicians understand that you rely on refrigeration units and other kitchen appliances to keep your business up and running. If we can save you money with practical repair work, we’ll do it. Your walk in refrigerators are a big investment. Let us help you make the most of each refrigeration expenditure. We’ve been in the business long enough to understand that actions speak louder than words. If you’re looking for a reason to trust us with your walk in refrigerators in North Shore, check out our customer testimonials. United Service Co. thrives because we build long-term relationships with our customers. We want to give you an estimate today and provide ongoing support years from now. When you think about the importance of refrigeration in your business, we hope you’ll remember our team’s commitment to your success. A walk in refrigerator can help you meet customer demands and grow into new markets and new product categories. Come to our established business with your goals, and we’ll recommend a long-term plan you can use to stay ahead of the maintenance cycle. Don’t wait until your refrigerator goes on the fritz to build a relationship with a qualified refrigeration company. For walk in refrigerators, North Shore businesses can reach our office at (800) 761-0900 or (978) 750-5600 for more information.